Hog Roast Denbigh – An Unusual Venue For An Engagement Party – At The Stables! Hog Roast Denbigh recently catered an engagement party at an unusual venue – a horse riding stables where the couple had met. Joanne and Tim called us not so long ago, after Tim had proposed (on horseback, no less!) and they asked us if we could serve our pigs in buns to their 65 guests outdoors at the stables. With the couple owning the stables and our portable hog roast machines not needing electricity as they run on gas, we saw no reason why not and booked the couple in for their special occasion. Having enjoyed our pigs in buns previously at a friend’s wedding, Joanne and Tim knew what they wanted for their engagement do – those same, moreish, mouthwatering pieces of heaven, featuring fresh rolls and wraps stuffed with meat that we’d freshly prepared and then roasted for hours on end, bits of crackling carved straight off the pig while it was still hot, our own homemade delights of sage and onion stuffing and tangy apple sauce and even a dollop of ketchup or brown sauce on top if preferred too, just to finish it off. 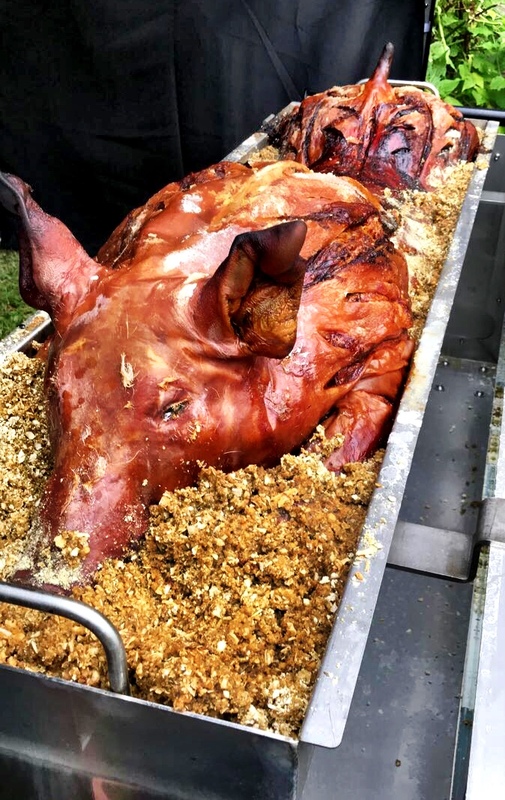 However, as the couple had invited some guests with dietary requirements, they asked us if we could provide alternative dishes too, We always can and do, here at Hog Roast Denbigh, as we love to ensure that everyone can enjoy our food. With one vegetarian guest and one guest with a gluten intolerance at Joanne and Tim’s party, we would also be providing veggie kebabs, with halloumi and various vegetables including mushrooms, mixed peppers, courgette, red onion and tomatoes, as well as gluten-free bread rolls so that guest would be able to eat our pigs in buns, as everything else is already suitable. Hog Roast Denbigh arrived at the stables five hours before the food service, and set up our equipment to start roasting the large hog from scratch, while the horses looked on. By the time the guests started arriving, the meat was resting and we were finishing grilling the skewers, slicing the bread rolls and dishing up the sauces, and then it was time to feed the hungry hordes. A Festive Party for A Corporate Client – Hog Roast Flint!